You’ve done your research and made a diagnosis—now what? Sometimes the plant has to be removed and never planted there again. Start over, do something else. Some diseases are difficult or impossible to control (virus diseases) especially when they are new or unknown to science. Controlling plant pathogens or abiotic disorders can be daunting, frustrating, even impossible. As I mentioned in the last blog early detection gives more options for control because the disease has not advanced to a degree where it can not be controlled. Controlling plant diseases is not just palliative (treating your plant’s pain) it involves understanding where pathogens come from, stopping their movement, arresting their development and preventing their spread. Understanding genetics of resistance can offer amazing control of diseases, and finally biological control limits the development and spread of many pathogens. 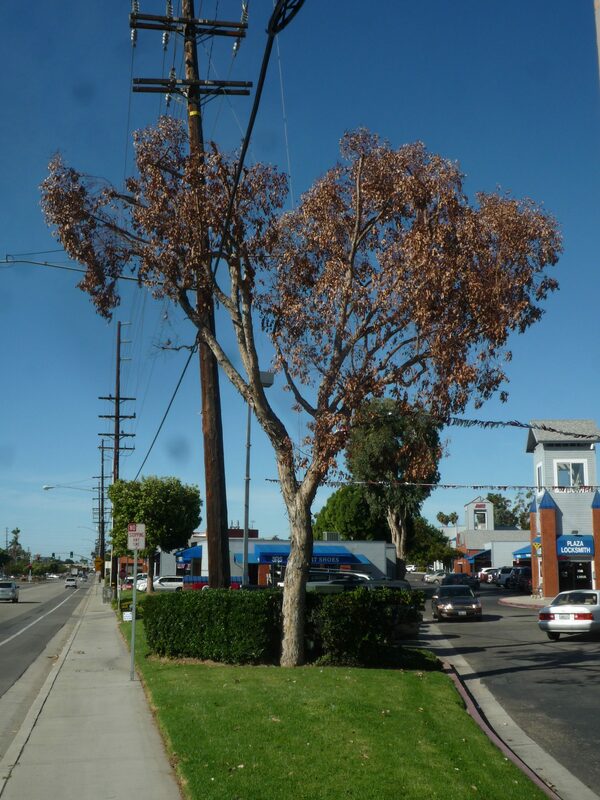 Once trees with root rot show symptoms it is too late for control measures, the tree is dead and will not recover. 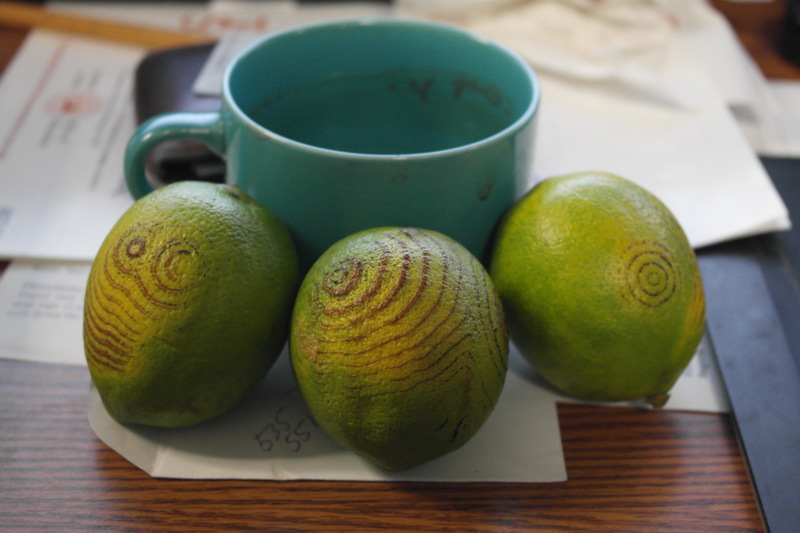 Here Phytophthora spp. has killed a eucalyptus tree. devastating effects become visible. By late season, in most vegetable gardens, viral titre (concentration) is very high in solanaceae plants (pepper, tomato etc) and in cucurbits, both groups are highly susceptible. When perennial plants get viral pathogens there is no cure, and symptoms will increase over time. In orchids, viruses can sometimes be avoided by tissue culturing the meristem (which is usually virus free) to clean up a rare plant worthy of salvation. Sometimes plants are already dead but don’t look it. In the case of root rotted trees and shrubs, leaves may still hang from the tree, may still be green but the tree is beyond salvation, control may not be possible. In general control measures are best conducted early. And by early I mean before you obtain your plant! All plants should be inspected carefully, especially root systems. Always remove a sample from containers to inspect. 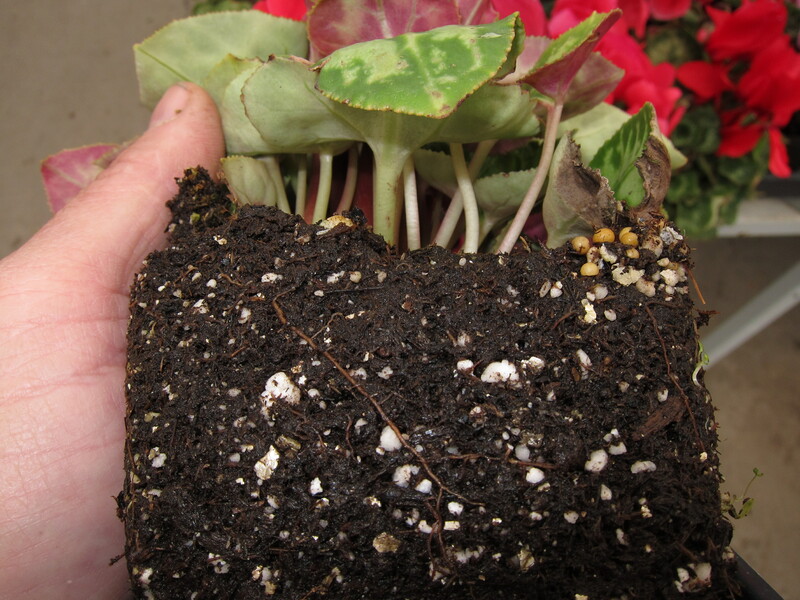 Here cyclamen are shown with root rot. system. I don’t purchase anything (even boxed trees) without doing this first. If you are satisfied that you have a healthy plant then you are ready for the next phase of disease control. Plants are often quarantined before they are released for cultivation or planting. When you bring your plant home, leave it in the pot for some time. Even bedding plants if purchased young can grow for a bit in containers. Remember lack of growth is a symptom of incipient disease. Observe your new purchase of a few days or even weeks depending on the plant. If normal growth is occurring then move on to garden placement and planting. A little time set apart from other plants, and careful observation, will possibly prevent bringing something bad to your garden. Once disease is established, and symptoms are apparent, gardeners often turn to pesticides to try to provide therapy. Sometimes fungicides applied to a plant post infection will slow down the spread of the pathogen within or on a plant. Therapeutic approaches can also turn on plant defense systems or enhance them so that the plant can limit the progress of disease. Therapy is usually not an option with most diseases because the pathogen has often gone beyond the point of stopping it by the time disease is recognized. Some fungicides applied early, can be very therapeutic in turfgrass diseases, blights and powdery mildew diseases. The key to therapy as a control option is to detect the disease early and use an efficacious material that is labeled to control the pathogen you think is causing the disease on a given plant. All this should be on the label. Pruning out branches with cankers is a form of eradication. An immediate response of many gardeners when disease is discovered is to kill the pathogen. This is eradication. Eradication takes several forms. There are eradicant pesticides, that kill the pathogen on contact. Usually these cause some degree of harm for the host since most pathogens have a host relationship that is destroyed when the pathogen is killed. Eradication can also be or removing plants from the garden that are a source of disease. Picking up and disposing of fallen plant debris is eradicating a source of potential inoculum from the garden. 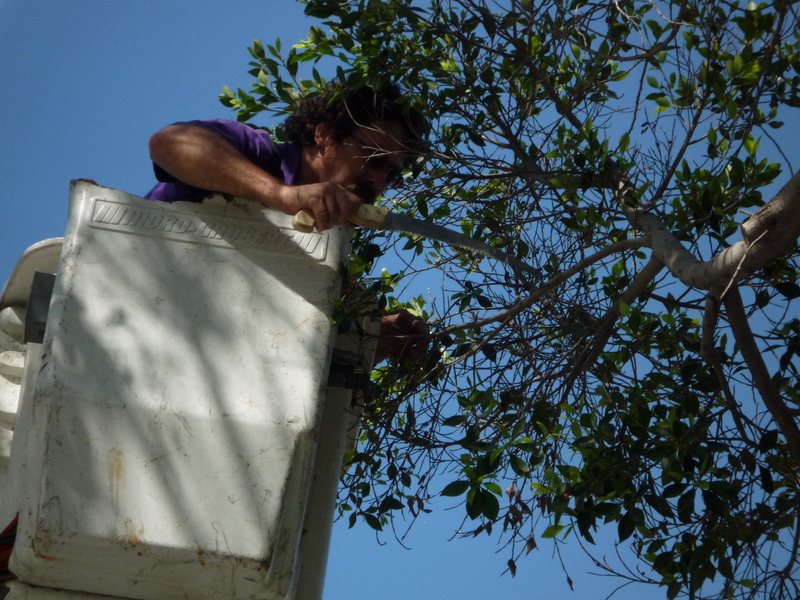 Pruning cankered branches from a tree is a form of eradication. One of the best forms of disease control is resistance. Selecting plants that resist disease is built in control. Diseases such as rust and powdery mildew have wide ranges of interaction with their hosts. By selecting plants that are resistant, there is no need for other control measures such as sprays. Resistance to plant disease comes as two types. 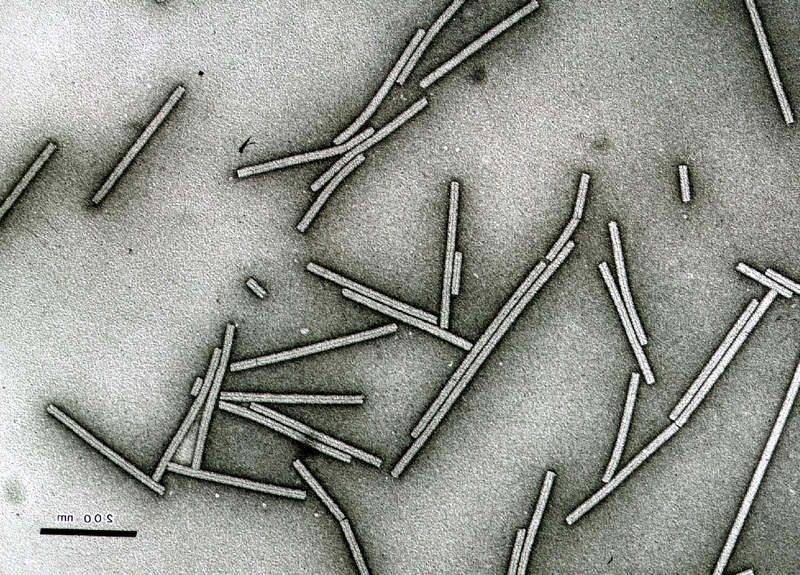 Horizontal or multigenic resistance is partial or incomplete resistance and is conferred by several genes or their interactions in the host with the pathogen. Vertical or complete resistance is resistance conferred by a single gene in the host. Plants with horizontal resistance will get some of the disease but it won’t be overwhelming, often in grains, lack of resistance will result in complete crop failure. Plants with vertical resistance show no symptoms and are completely immune to the pathogen. While this complete resistance is appealing, it is only conferred by a single gene, and the pathogen can easily break down this resistance and cause disastrous disease. Horizontal resistance while not complete, is called “durable” resistance because it takes more time to overcome resistance conferred by multiple genes. The nature of resistance in garden plants is rarely detailed by growers or seed sellers. Often we are lucky to see any labeling for resistance. Crops like rose, crape myrtle and snap dragon are often sold as resistant to powdery mildew or rust and in some cases plant breeding programs strive to incorporate disease resistance into their breeding lines but then fail to label the product as disease resistant! Cultural control often involves doing the right horticulture. 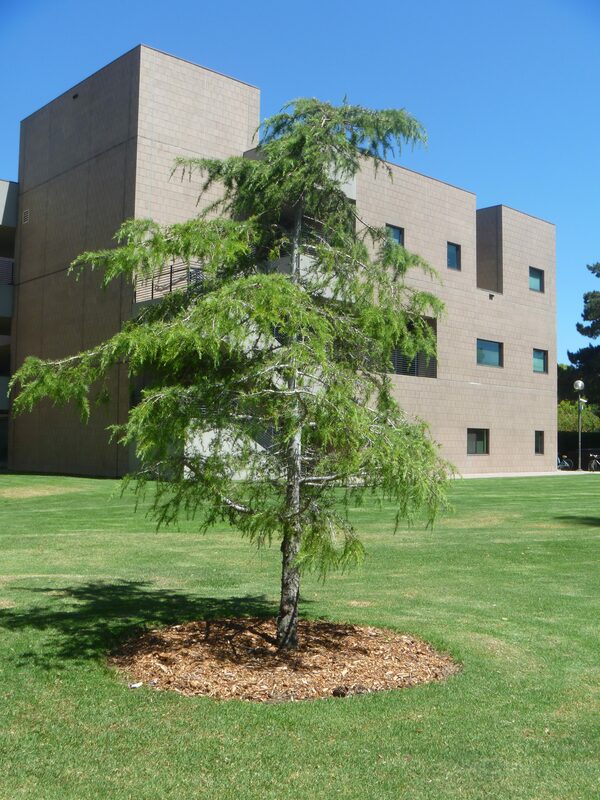 Keeping turfgrass away from the stem of trees, applying arborist chips, planting at the right depth, are all cultural controls for root disease. Cultural control is using good horticultural practices to limit the development of disease. Since many plant pathogens require a host to be predisposed, we have the opportunity through good horticulture to avoid the disease development. Planting woody ornamentals at the right depth is a cultural control of Phytophthora collar rots. Appropriate application of water, reduces stress and prevents plants from being predisposed to both root rots and canker diseases. Correct pruning cuts limit the development of decay in trees. Appropriate horticulture as discussed in the Garden Professors page will go far toward cultural control of common garden maladies. Proper plant selection is also a form of cultural control. Choosing plants adapted to the growing area climate, and soils selects plants that are less likely to be predisposed to disease. Poorly adapted plants are more susceptible to pathogens and thus more likely to become diseased. Biological control is the effect of one organism limiting the development of another thus preventing disease. Classical bio-control is when an exotic pest is introduced and there no natural enemies or parasites to regulate it. The pest/pathogen multiplies rapidly killing or affecting a large plant population. Research in the native range of the host looks for native organisms to control the pest. They are brought to the infestation, released and the pest/disease is brought into control. This works well with insects and the damage they cause. It has also been achieved with exotic plant pathogens. For our native pathogens, there may already be a community of organisms that limit its development. This is especially true for soil-borne pathogens. This is why the GP professors so often recommend fresh wood chips as mulch. Fresh wood chip mulches supply carbon for organisms in soil that interfere with soil-borne pathogens; a kind of mulch-mediated bio control for root diseases. I find controlling diseases is a lot more difficult than understanding or identifying them. Usually by the time you have observed disease in the garden it is too late to stop its progress. You can take mental notes not to plant that variety again, or prune more diligently etc. but diseases are largely regulated or advantaged by the environment and our good or bad gardening practices. Of course the pathogen has to be present for biotic disease to happen, as we know that organisms don’t spontaneously generate. Disease control starts with identification then research and finally gardening actions that help prevent, limit or eradicate disease propagules.